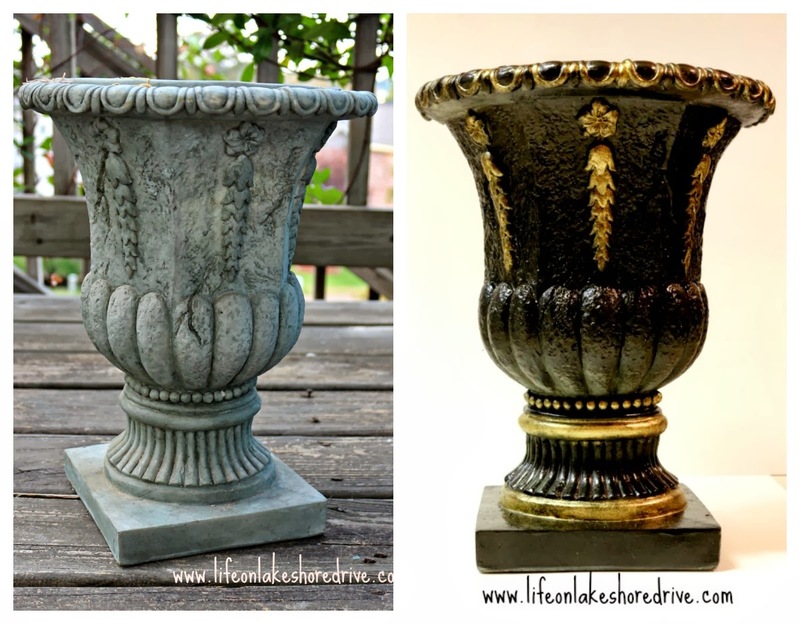 Here is an easy way to take a planter from dull and drab to fab in no time at all! 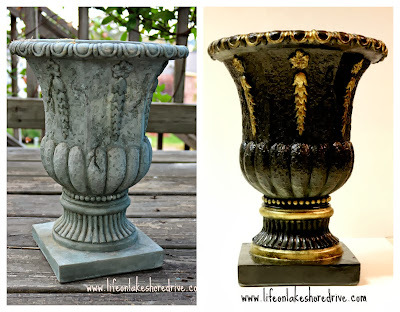 Today I am sharing with you my flower urn planter makeover. 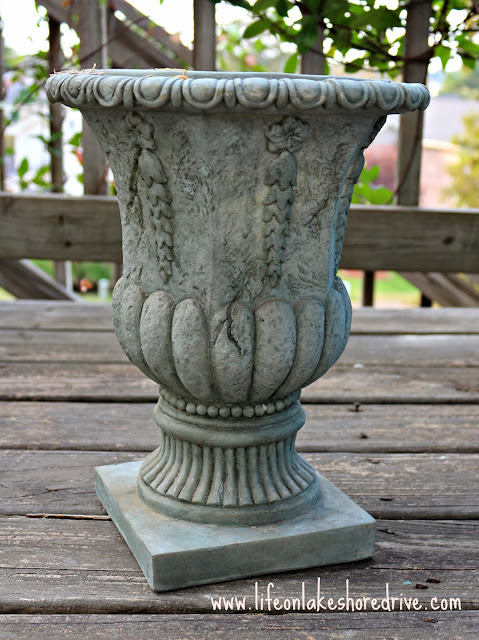 I purchased the flower planter below at an estate sale for a little of nothing. It had white tall sunflowers and cattails in it. I think the original sticker was still on it from one of the dollar stores. It is a super lightweight pot, and probably was intended for inside use only. It was actually a very dark green pot to begin with, but I've had it on my front porch since the beginning of summer. The sun has not been kind to it, and the flowers definitely had to go. The sun did a number on this planter in no time at all, but this photo actually makes it look better than it really did. I decided to spray it with the Rust-Oleum Hammered spray paint that I had left over from my Solar Lights Lantern Lamp Post. I was working on this at night, and the photos were taken inside. I try to never use the flash, but I had no choice this time. I gave it two coats of the spray paint, and allowed it to dry overnight. Then next step was my favorite part of the whole project. 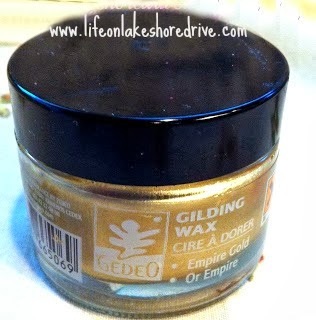 I love using this GedeO Gilding Wax on anything I can get my hands on. I seriously love this stuff. That tiny little jar has decorated an amazing amount of projects, and there is still a lot left in it. I used my medium sized flat bristled paint brush and simply rubbed the gilding on the areas I wanted to highlight. As always, I got a carried away. I was only going to gild a few places on it, but the details it adds are so amazing I just kept going. I really had no intention of adding the gold at the top, but I am so glad I did. 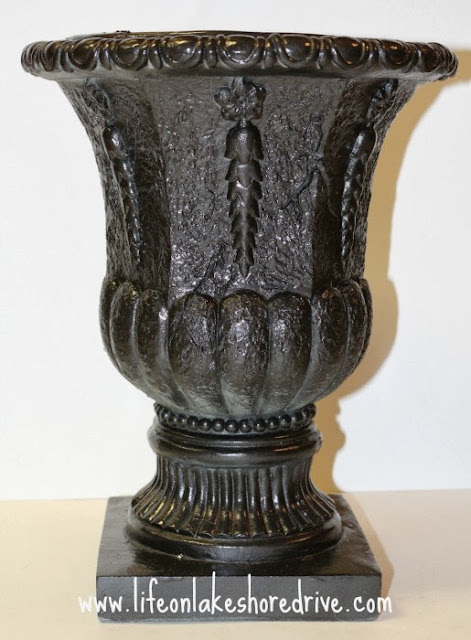 Wow, what a difference a little paint will do! I love the new look. I was going to use it on my deck, but it has found a new home in front of my fireplace. After I added my fall floral decor, it looked perfect in front of my fireplace. Here is a little sneak peek of my Dollar Store pumpkin topiary fall arrangement using my makeover planter! You can click here to see Part 2 of this post and the tutorial for this arrangement. Thank you so much for stopping by for a visit! 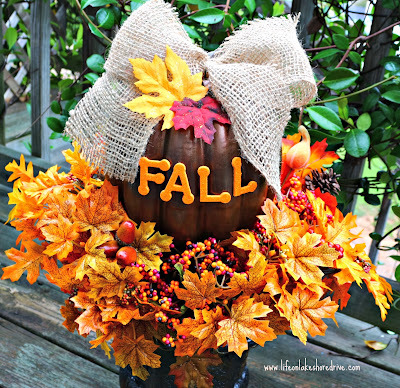 I am trying to get all of my fall decor posted. Stay tuned for more to come!! That is a gorgeous transformation! Looks like a million bucks! This is so gorgeous!!! Love it. 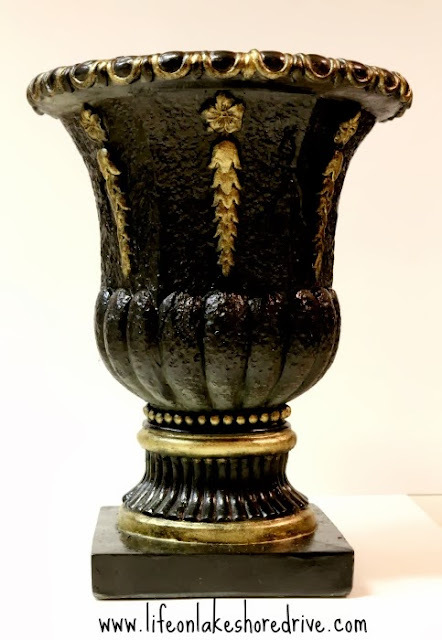 I love urns and I love gold gilding so this is right up my alley. Lovely!